I’ve found lost dogs before and returned them to their owners. I’ve even found a hamster and hermit crab–although the latter two don’t really count because they were mine, and I lost them in my house. However, I have never found a tortoise before with or without red feet, not before today anyway. I was in the schoolyard that backs up to our rear property line this evening and had just completed weed-whacking along our back fence. While heading home I was whacking some weeds along our neighbor’s fence when I was confronted by a South American Red Foot Tortoise. Confronted is probably not the right word since the creature was looking up at me from under some tall bushes. Since it was only about a foot long I didn’t feel threatened. 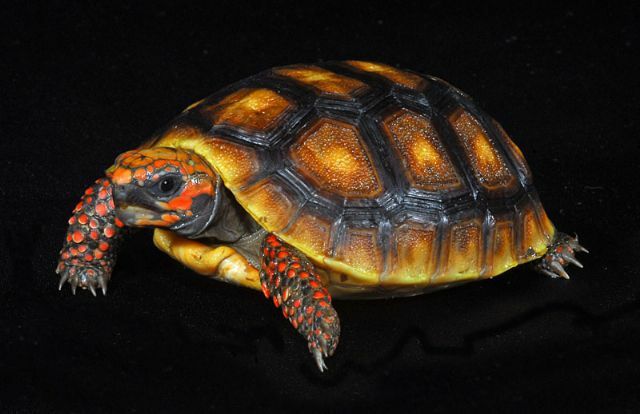 In fact, I thought it was a cool looking animal with a colorful carapace (shell), red legs and face. It also had a bit of an overbite that I figure it used to tear meat. Maybe I was wrong but I didn’t want to put my hand by it to find out. While it’s not every day I run across amphibians while weed-whacking, I must admit I wasn’t too surprised to have found this one. That’s because a sign had been posted for about a week on the front lawn of a home about 200 yards down the street from us with a photo of the creature I was looking at and the word “LOST” in large block letters. In fact, I guess I was more surprised that 1) someone was looking for something other than a dog or cat and 2) the fact that someone could even LOSE a tortoise. After all, it’s not like those things can run, jump or fly. In fact, I would think it’s pretty darn hard to lose one’s tortoise. Anyway, to make a long story short, after finding the tortoise, I went home, dropped off the weed whacker and went in search of the owner. I left the tortoise were it was figuring that since it had survived the wilds of the schoolyard for nearly a week it would be safe for a few more minutes. Plus, my mama told me never to pick up strangers, be they people or tortoises. I walked down the street to find a woman sitting on the front porch of the house with the sign. I announced my find and we set off. While accompanying me to the spot she explained that the tortoise was native to South America and the family had owned it for about seven years. She said it wasn’t very friendly but seemed to recognize their voices. It lived in a fancy box in the house and needed a heat lamp to keep it warm. The tortoise was where I had found it and I pointed it out to her when we arrived. The reunion was pretty unemotional on the part of both parties. I guess I was more excited about finding the animal then the woman was about getting it back–or the tortoise was about going home. Going out onto the internet afterwards I found those things retail for about $150 – $290 each when they are 3-4 inches long. Based on that I would have thought the woman would have been ecstatic to find the creature since it must have been worth nearly a grand. I was glad to have found it but I wouldn’t have wanted it. Gimme a dog anytime. And it doesn’t even have to have red feet.